CES is the publisher of EuropeNow, an online monthly journal of ideas, art, and politics relating to Europe, with a blog that publishes weekly. The journal features research, criticism, and journalism on Europe alongside literary nonfiction, fiction, poetry, translations, and visual art from or concerning Europe. EuropeNow's mission is to provide a unique, kaleidoscopic understanding of various political and academic topics, and to expand this dialogue to literature and the arts. The European Studies Newsletter provides a timely mix of news about CES and its programming, as well as external jobs, fellowships, conference calls, and other items of interest to the broad community of researchers and scholars studying Europe. 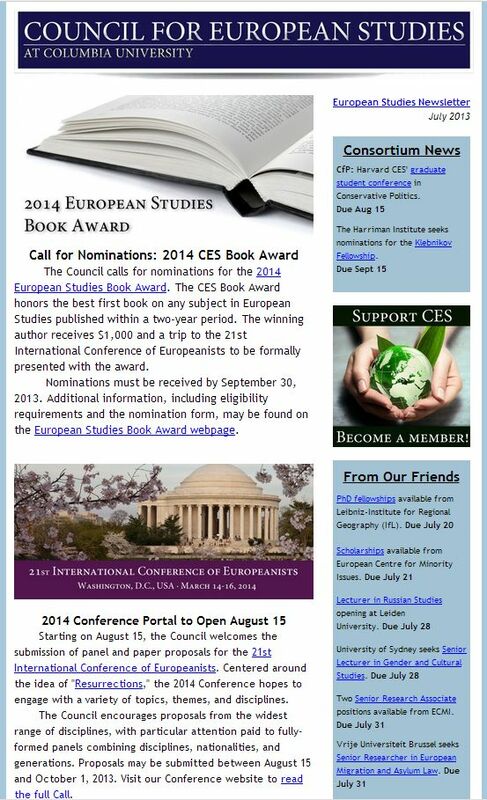 The Newsletter has been continuously published by CES since the organization's founding in 1970. You can subscribe to the newsletter here.